There are few things that bother me more than throwing out food, so I’m often looking for ways to recycle leftovers, use up stray bits of veg and other stuff in the fridge or, as in today’s recipe, make good use of trimmings. I often use trimmings as a flavor booster, as when I add, say, asparagus peelings to the broth for asparagus risotto. But sometimes the “trimmings” are actually worth eating for their own sake. Last week we featured erbazzone, a savory pie made with a Swiss chard filling. Swiss chard is a versatile vegetable. While you can use both leaves and stems for the filling, if you opt to use only the leaves, you shouldn’t throw the stems (or ribs) away. They make good eating themselves. With a mild beet-like flavor and crunchy texture, there are all manner of uses for them in the Italian kitchen. Today’s recipe is one of my favorite and also one of the simplest ways to prepare Swiss chard stems: simply parboiled, napped in béchamel, sprinkled with cheese and butter and gratinéed in the oven until golden brown on top. And if you’d like to make a more substantial dish, you can intersperse the stems with layers of ham and cheese, a more elaborate version sometimes referred to as a parmigiana. Trim the steam top and bottom, then cut them into lengths. Parboil in well salted water until tender, about 5-10 minutes depending on their size. Drain and let cool. Meanwhile, prepare the béchamel sauce following the directions in this post. Grease the bottom of a baking dish large enough to hold all the chard stems in one or two layers (or, if you prefer, individual dishes as pictured here). 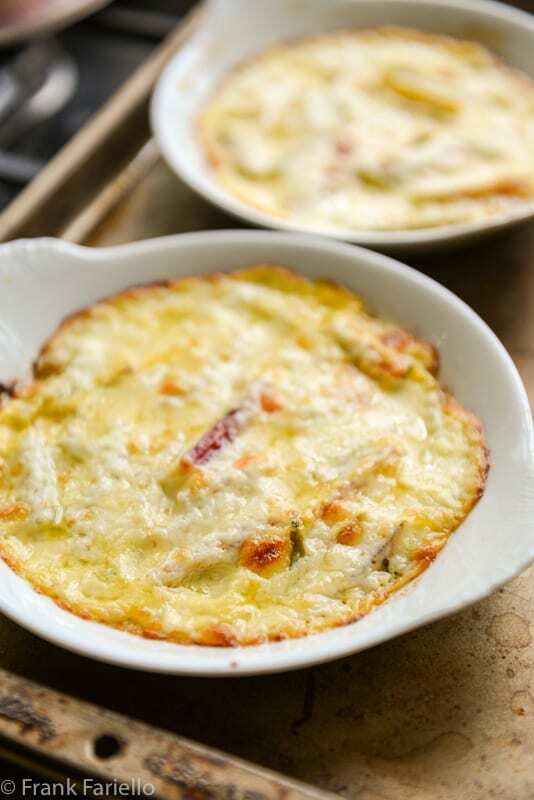 Lay on a layer of chard stems, topped with slices of ham and/or mozzarella if using, then nap with béchamel and top everything with a good dusting of Parmesan. Repeat until the chard is used up. Top with a sprinkling of breadcrumbs, if using. Finally, dot the top with bits of butter. Bake in a moderately hot (190C/375F) oven for about 20-30 minutes, or until the sauce is bubbling and the top is nicely brown. Remove from the oven and let cool for about 10-15 minutes before serving. Swiss chard stems vary in color tremendously. They’re often sold in “rainbow” bunches to show off their variety. Apart from the tradition white, their stems and ribs can be various shades of red, pink, green or yellow. Personally I don’t find much difference in taste among them, but mixing different colors certain add visual interest to a dish like this. Frank, you are a vero Italiano – wasting nothing! Those bits and stems that many discard are full of flavor and have so many tasty possibilities. I think Swiss chard is like our silverbeet ( as its known in Australia). I boil and chop them and mix them with egg, cheese and flour to make frittelle. I’ll be planting seedlings soon in the garden so I’ll keep your recipe in mind – besciamella and cheese is always good! Yes, I think you’re right Marcellina, based on a quick Google search. (And Wikipedia, which will redirect you to the article on Chard if you search for “silverbeet”.) In any event, your idea of making frittelle out of them sounds wonderful. Going to try that next time I have trimmings to use up! Indeed it does, at least in this case! I have this same recipe on my site, except we used provolone! My mother didn’t want to throw away the stems and made this. It’s SO delicious and perfect as a side dish! Thanks for posting this, Frank. Our Nonna made something only known to us as coste, and I never got to learn her method. My dear late sister did, and she talked me through it once, but I’ve forgotten. At any rate, it’s not this recipe, but she would make it after using the leaves for what she called veal birds, which were the leaves stuffed with ground veal and whatever she had in the fridge. For the coste, I think they were parboiled, then sautéed with a little garlic. The next steps are blurry to me. Red wine vinegar and whisked eggs were involved, but I don’t remember what went down first. Cheese may have been involved after the other ingredients were combined. Nevertheless, we loved it. I loved the bite of vinegar with the stalks. I’m going to have to give your recipe a try! You are a man after my own heart. I detest throwing out food, and I could say that most of my work in the kitchen consists of using up the remnants of things I bought for some other dish. Thanks for the recipe! You’re welcome, Jeff! Sounds like we’re definitely on the same page when it comes to wasting food. un delizioso modo per riciclare qualche avanzo, è diventato un piatto da re ! I love these easy and delicious recipes. I want to make and eat this now! Have a nice day, ciao! Thanks for stopping by, Elida! Swiss chard stalks should NEVER be thrown away, as your recipe shows. I have never made them with a béchamel, but have granite them with parmesan cheese and bread crumbs. Like your beloved Angelina, my mom used to make them parboiled, then added egg and bread crumbs and fried them — a recipe I still make and posted on my blog a while ago. Swiss chard is my favorite green from the garden. Glad it brought back those memories, Paola! Chard is a mainstay in the Swedish kitchen. Especially during the colder months. We make a similar gratin with the stems here. However, we use a different cheese and add cubed kassler (Canadian Bacon). I like the idea of using the bread crumbs and the Parmesan cheese. I didn’t know chard was so popular in Sweden. That gratin sounds like basically the same dish, just using local ingredients. I’m sure it’s delicious, too. I totally understand where you’re coming from the wasting food thing, Frank. I hate wasting food, and we try our hardest to use as much as possible. Extra trimmings usually go into making a veggie stock for soups/etc, but I love the idea of turning them into the star of the show by themselves. This looks amazing, my friend! In other news, we’re heading to Italy for vacation soon, and I need to check out some of your regional recipes for a heads up! Yum! Thanks, David. Enjoy your trip to Italy. I’m sure you’ll have a great time. And if you have any questions about dishes let me know. To be honest, I can’t think of much that would be bad when prepared this way. It looks really good. I have been known to throw my chard stems in my worm box . I sometimes cook them with the leaves . Your recipe looks great and I have to try it. Thanks! I’m sure you’ll like it, Gerlinde. Thanks for stopping by! It’s a cracking dish. I often throw in the blanched leaves, too, based on a similar recipe I first ate in Paris. I did once manage to turn the bechamel an unlovely shade of pink thanks to the ruby chard I was using but it still tasted good! It’s the taste that counts, Linda! (Except when you’re blogging, unfortunately… ) I do like the idea of a few leaves in there, even if just the bits of leaf that still cling to the stems. That’s nice as well. This is wonderful! I too often toss the stems when I’m cleaning Swiss chard, and always feel guilty — I do know how good they are. So having a recipe that requires them is a life-saver. This looks SO tasty — love the idea of this. Thanks!